Scroll down for excerpts, reviews, corrections, and information for teachers (including PPTs). Go to my foreign translations page for more info if you want to read this book in Chinese (both simplified for mainland China and traditional for Taiwan), Czech, French, Italian, Japanese, Mongolian, Polish, Russian, Spanish, or Vietnamese. PS. 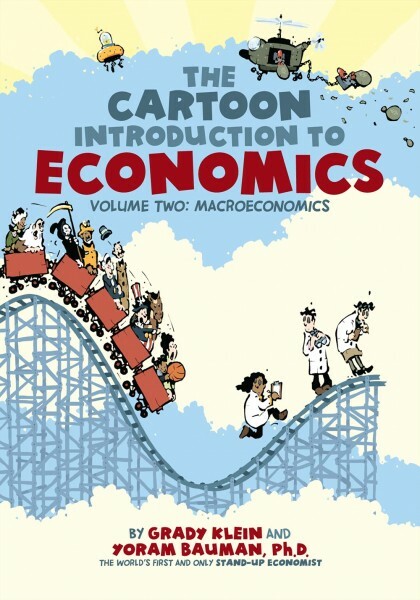 Click here for similar info about Volume One: Microeconomics. Details about upcoming shows here, please contact me to bring economics comedy to your school, corporate event, or comedy club! If you are with a public high school, community college, or the armed forces, or are otherwise looking for a free show, click here. Below is one of my favorite chapters! To download it in PDF (plus the front and back covers and Table of Contents), click here. Or you can just download the front and back covers and Table of Contents. The items below (except the first one!) are mostly quibbles rather than corrections, but in any case email me if you find anything to add to this list! Pages 223: The index entry for “Great Recession” should say “the worst economic downturn”, not “the worst economic downtown”. Thanks to Joseph Tao-yi Wang at National Taiwan University for finding this typo, and for helping with the traditional Chinese translation! Page 117: I pushed hard for a shout-out here to Harriet Tubman. I lost, in part because the book was near completion and a revision would have affected multiple pages. Page 140: We went back and forth about whether to change “In Europe many countries use Euros” to “In Europe many countries use Euros… at least for now!” We chickened out and went with the former. Page 141: Using the market for cars at the top is confusing because in the Micro book we use cars to describe adverse selection. This should be changed if we get a chance. Page 147: The accent mark on “adios” should be over the “o”, not the “i”. Page 146: Every time I look at the bottom panel I’m afraid the guy is sticking out his middle finger. Page 160: The “unfortunately” at the top of this page is awkward. Maybe there’s a better way. Page 182: The first quote at the top was inspired by a quote from climate scientist David Rind in Field Notes from a Catastrophe: “I wouldn’t be shocked to find out that by 2100 most things were destroyed.” We shortened it, and I lost a battle with the copy editor, who changed “most things were destroyed” to “most things have been destroyed”. Oh well. Page 217: In the middle panel, maybe “short-run stability” and “long-run growth” should be reversed. If you ‘re a college or high school instructor looking to adopt the cartoon book(s) for a class and you don’t want to shell out $12 you can click here to get a desk copy (free if you order 20 copies) or an examination copy (just $3 per book :). Send a note on school letterhead to the address in the link and ask for a copy of The Cartoon Introduction to Economics, Volume Two: Macroeconomics, ISBN 978-0809033614 and/or The Cartoon Introduction to Economics, Volume One: Microeconomics, ISBN 978-0809094813. Also FYI both cartoon books should be available at a steep discount (possibly even free!) as part of a Worth Publishers package deal with intro texts by Krugman/Wells, Cowen/Tabbarok, or Chiang. For more info contact WorthEconomics@worthpub.com, and if you have any trouble please contact me. Detailed page notes (and haiku summaries!) are available here, see the sample chapter below. For information about PPTs for use in class, please email me using your school email address. Page 4, micro versus macro: The division between micro and macro is not always clear, e.g., you can study international trade from a micro perspective (treating two countries just like two individuals) or from as macro perspective (for example, dealing with exchange rate issues or distributional issues). Nonetheless, there is a rough dividing line between micro and macro, perhaps best described (to paraphrase P.J. O’Rourke) as being that microeconomists are wrong as specific things and macroeconomists are wrong about things in general. Page 6, microfoundations: Providing “microfoundations” for macroeconomics has been a major goal of the past few decades of economics research. It’s easy to say that there’s unemployment during a recession, but how do you get that to match up with what microeconomists say about prices adjusting to balance supply and demand? We’ll return to this in Chapter 2. The urban streets of the 1870s and 1880s were full not just of horses but pigs, which were tolerated because they ate garbage… Added to putrid air was the danger of spoiled food—imagine meat and poultry hung unrefrigerated for days, spoiled fruit, bacteria-infected milk, and so on. Epidemics included yellow fever, scarlet fever, and smallpox… In 1882, only 2 percent of New York City’s houses had water connections… Rural life was marked by isolation, loneliness, and the drudgery of fireplace cooking and laundry done by musclepower… Coal miners, steel workers, and many others worked 60-hour weeks in dirty and dangerous conditions, exposed to suffocating gas and smoke… Sewing in a sweatshop might have been the most oppressive occupation for women, but was not as dangerous as soap-packing plants or the manual stripping of tobacco leaves. Another good and very accessible read here is the OECD website devoted to Angus Maddison’s 2006 book The World Economy: Volume 1: A Millenial Perspective. Another excellent read (with a modern slant) is Sections 3-6 of Robert Gordon’s “Is U.S. Economic Growth Over? Faltering Innovation Confronts the Six Headwinds” (NBER Working Paper 18315, 2012). Page 8, “10% of kids died before their first birthday”: Read the CDC’s “Achievements in Public Health, 1900-1999: Healthier Mothers and Babies” (MMWR, Oct 1999). PS. Yes, the wheel does apparently date back to about 5,000 BCE. Page 8, “wealth of nations”: The full title of Adam Smith’s surprisingly readable Wealth of Nations (1776, full text here) is An Inquiry into the Nature and Causes of the Wealth of Nations. Page 10, the Great Depression: The term “macroeconomics” apparently did not come into being until 1933, so one could say that macroeconomics literally started during the Great Depression, which started in 1929 and lasted for about ten years. Page 11, dentists: The dentist quote is a paraphrase of Keynes: “If economists could manage to get themselves thought of as humble, competent people, on a level with dentists, that would be splendid!” I haven’t confirmed this quote directly, but apparently it comes from a fascinating essay called “Economic Possibilities for our Grandchildren” that appears in Essays in Persuasion (1931). The quote appears in many places, including in a thoughtful essay by Greg Mankiw on teaching and practicing macroeconomics: “The macroeconomist as scientist and engineer” (2006). Page 12, “the best of all possible worlds”: The reference is to Pangloss from Voltaire’s Candide (1759). Page notes for other chapters are here. hi, i just wanted to ask if these two books are available in Delhi, India. thanks. YB: Probably at an English-language bookstore, but no Hindi translations yet, sorry. Is there any chance buying a soft copy? YB: These sorts of decisions are in the hands of my publisher… and so far they haven’t been pursuing them. Sorry. But… I’ll keep asking them! Hey why dont we translate the books into Spanish? I’m an MBA and PMP working full time but free on the weekends. including articles by Olivier Blanchard and other leading economists. I wish I had this book for my macroeconomics class in college! My oldest is graduating high school this year and is home schooled. Do you have a study guide to go with this? Hi Robin, thanks for your kind words! And… detailed page notes are available here. Enjoy!